To advance the improvement of the health of the people of Nebraska through the provision of better health care. To foster and sponsor educational programs for training of health career personnel. To provide financial aid for Nebraska hospital employees needing assistance in the pursuit of an education in the health care field. To promote and sponsor research of health care issues. For more information, contact Kim Larson, director of marketing, via email or call (402) 742-8143. The 2019 application process is now open. Deadline for submission is May 17, 2019. Considering the importance and complexities of high-quality health care in today’s society, it is critical for bright, talented people to be encouraged to pursue professions in the field. With that in mind, the NHA Research and Educational Foundation offers the Undergraduate Health Care Career Scholarship Program, designed for students interested in a career in health care. These scholarships support future leaders in their efforts to earn a high-quality education. 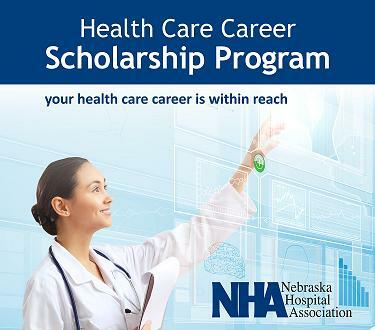 This scholarship is available to students who are employed by an NHA member hospital and who are enrolled in an accredited program leading to a bachelor’s degree, certification or registration in a health care career. Approved programs include, but are not limited to, nursing, radiological technology, clinical medical technology, physical therapy, etc. Ten recipients are selected to receive $1,500 for the academic year. Applicants must be employed by a member hospital of the Nebraska Hospital Association for at least 1 year. This scholarship is awarded to students pursuing a graduate degree in health care at an accredited college or university or an accredited institution offering online degree programs. The purpose of the scholarship is to assist with tuition and academic expenses in the form of an award of $3,000 for an academic year for eight individuals. Applicants pursuing a graduate degree in health care administration are preferred, but many programs are still eligible. The NHA Foundation is pleased to provide additional scholarships due to a generous donation to the Health Care Career Scholarship Program from both FocusOne Solutions and Aureus Medical Group. These new scholarships assist students who are working toward a career to improve the health and well-being of Nebraska’s communities. Aureus Medical Group and FocusOne Solutions are dedicated to helping outstanding health care professionals take the next step forward in their health care career. The Nebraska Hospital Association Research and Educational Foundation (NHAREF) is proud to announce the recipients of the 2018 Graduate Studies Tuition Aid Program and the Undergraduate Health Care Career Scholarship Program. Nebraska’s hospitals are proud to support these outstanding students who will keep our quality of care among the best in the nation.